Recently we took our first round-trip road trip together, from Woodinville, Washington to Rosamond, California, to be with Jeni’s family during Christmas. Our trip began on Saturday, December 21st. We packed up our car for the week-long journey, and set out to downtown Seattle, to watch The Two Towers at the Cinerama with a group of our friends. Not a bad way to start a road trip, if you ask me. After the movie, we drove as far as Vancouver, and stayed the night with my (Tim’s) parents. On Sunday, just as we were about to hit the road, my dad (Norm) did a last minute check over the car to make sure it was in good order. Not that he doesn’t trust his son, but he just likes to watch out for him. Good thing, too, because as it turns out, they had run over a nail that morning, and the back-left tire was leaking fast. Ah hah, no big deal, we’ll just have it repaired. WRONG! As it turns out, tire places aren’t open on Sundays. So… what to do… Again with the good idea, Norm came up with a scheme whereby Matthew (my brother) and I would switch tires, since Matthew’s car was the same model as ours and only one year different. Perfect. Half an hour later, as we are heading out for real, Norm asked “Do you want to check the spare tire, to make sure it has air in it?” Considering that the trunk was full of Christmas gifts for Jeni’s family, and the presents we had just received from my family, we weren’t too keen on that idea. Besides, we had fixed our tire problem. Clear sailing from here on out. I’m sure the spare tire is fine. So off we went. So, um… what’s with the blowout, then? Didn’t we fix the tire? Right. The back-left tire was fine. 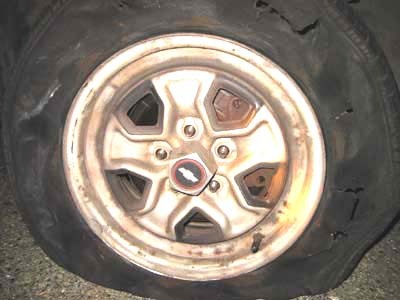 But when we stopped for gas in Grant’s Pass, just 42 miles from our destination, the front-right tire sprung a leak. In fact, we didn’t even notice the leak. The attendant (for those of you who don’t know, you can’t pump your own gas in Oregon, so all stations have attendants) came running over to us and told us about it. It was leaking so badly that he could hear it 30 feet away. As it turns out, we pulled the car just a tad bit too close to the curb while pulling away from the pump, and the wheel was turned just wrong such that the nozzle was pinched between the tire and the curb, and something gave (hint: it wasn’t the curb). This is where the story gets somewhat embarrassing. A sensible person would have stopped right there, at the gas station, put on the spare tire, and had the leak repaired the next day. But, I’m not a sensible person, I’m an engineer. Only a week before had I poured scalding hot Wassail from a Crock Pot into a jug without spilling a drop, using only a thin paper plate. So, when the attendant found out that the audible hissing from the tire could be stopped by pushing the nozzle to one side, I came up with a brilliant plan. Running inside, I grabbed a book of matches, which I then proceeded to smash in between the nozzle and the hubcap, thereby stopping the noise. No noise, no leak, right? Perfect. That will hold for a few more miles to Ashland. Obviously, it didn’t. Although we did maintain a relatively low speed, about 4 miles down the road, the matchbook must have come loose, because the tire pretty much exploded. Fortunately we were near an exit, so, after cutting in front of a semi truck going 10mph faster than me, we exited the freeway and came to rest off the side of the road on a paved area. You may think that at this point, we were pretty distraught. Think about it. 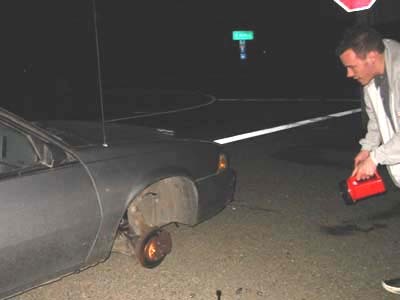 We were sitting there, in the dark, on the side of a rarely-used exit, somewhere in southern Oregon (as in, endless fields and hills with very few people), with a smoldering, blown-out tire, and oh yeah, remember that spare that my dad wanted us to check??? For some reason, though, we were actually in quite good moods. Although it had been raining when we left Vancouver, it was completely dry here, we had a powerful flashlight, and, as it turns out, the spare tire was indeed in just dandy condition. Look, you can even see a smile on my face as I prepare to put the spare tire on. So, I think I’ve just about rambled on enough now about a silly flat tire. We got the spare put on, and made it to Ashland okay, and the rest of the trip was just super. I’m sure there’s a moral to this story somewhere… Lemme think… Okay, how about this: “Matches don’t fix tires.” Yeah. I like that. Four score and seven years ago (that’s 87 years, in layman’s terms), our forefathers—okay well never mind, my wife has vetoed that introduction. Go figure. So anyway, from the day that the rings were picked up from E.E. Robbins, Tim kept them in his immediate possession at all times. At work, classes, and in his bedroom, he always kept the red backpack with the 3 ring boxes in the front pocket (her engagement band, her wedding band, and his wedding band) close by his side. Considering that the rings were by far the most valuable items that he owned (both monetarily and sentimentally), he was very, very careful not to let them out of his site. Well, by now you’re probably thinking “hey wait a minute… isn’t it the best man’s responsibility to keep the rings?” Well, you are right, it is. However Tim and J.R. (the best man) had an understanding. The rings were to stay in Tim’s possession until the morning of the wedding. 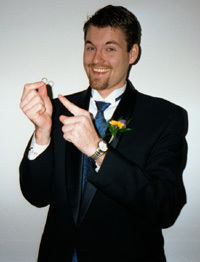 When they arrived that morning, Tim would then hand the rings over to J.R., so he could fulfill his best manly duty. What could happen to them in the course of a few hours? As it turns out, more than you think. After they were all spiffed out in their dandy tuxedos, the time came for the rings to be handed over to J.R.. Tim took each of the three rings out of their box, and placed them all on one finger. After thoroughly checking for holes and finding none, J.R. held open his inside-suit-coat-pocket, and Tim held his finger over the pocket and dropped them in. silent stare of death. a sort of “that isn’t funny. tell me you’re kidding” look. So, Tim and J.R. checked the floor all around where they were standing, and they checked the lining of J.R.’s suit coat, just in case they somehow missed a hole in the pocket… no luck. The ring was not to be found. Panic began to set in. They crossed the lawn to return to the dressing room. They scoured the dressing room, and searched the lawn. They told everyone they saw, as they all joined in the search for the tiny wedding band. Tim tried to reason through the situation with J.R.. He tried to determine how the ring could have fallen out. Suddenly Tim realized that J.R. had leaned over the sink to wet his hair before geling it. He headed toward the bathroom with J.R., but was blocked, and told that he was not allowed to enter that portion of the building. This rather upset Tim. As it turns out, Jeni (of course not knowing anything about the missing ring) had decided that this would be a good time to arrange some candles in the sanctuary. As Tim waited for what seemed like hours for Jeni to finish, suddenly a happy shout arose from the direction of the guys’ dressing room. Pastor Lee had found the ring! It was lying on the floor in the dressing room, just below the spot that Tim and J.R. thought that they had placed the rings into J.R.’s pocket. Apparently, somehow the smallest of the rings had missed the pocket, escaping the notice of either of them. Ever the slaves to tradition, after the ring was found, Tim gave J.R. the rings yet again. J.R. counted them about every ten seconds from then until just before the ceremony, when he placed the rings, all three, on the ring-bearer’s pillow (which was a sunflower).